After running into warped doppelgangers of themselves while investigating the “private wellness resort” responsible for disappearing mutants, Rogue and Gambit find themselves in the fight of their lives and preparing to face off against a villainous figure named Lavish. Will they be able to close this case and save the day now that their memories and powers are being reabsorbed with every clone they defeat? 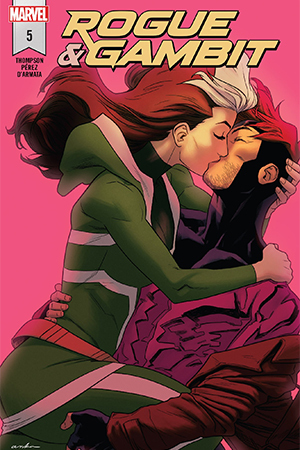 Plot: Rogue & Gambit #5 picks up where the last issue left off, with the mutant lovebirds still battling their way through various doppelgangers. Each one restores a piece of their powers or their memories, which is something Rogue especially would rather not experience. But as Gambit points out, taking the bad with the good is the only way to fight their enemies, and so she destroys a Charmagne golem only to absorb some of Lavish‘s powers as well. With them in hand, she has a much clearer plan for what to do next. Story: There’s a bit of an Eternal Sunshine of the Spotless Mind vibe in Rogue & Gambit #5, which is a very good thing for this story’s conclusion. The lesson is simple yet significant: those who cannot remember the past are condemned to repeat it. George Santayana’s famous quote may usually be applied to large-scale historical events, but it works equally as well for personal relationships and is especially true for characters as complicated as Rogue and Gambit. Lavish, the villain of the arc, becomes a non-factor pretty early on in the concluding issue. 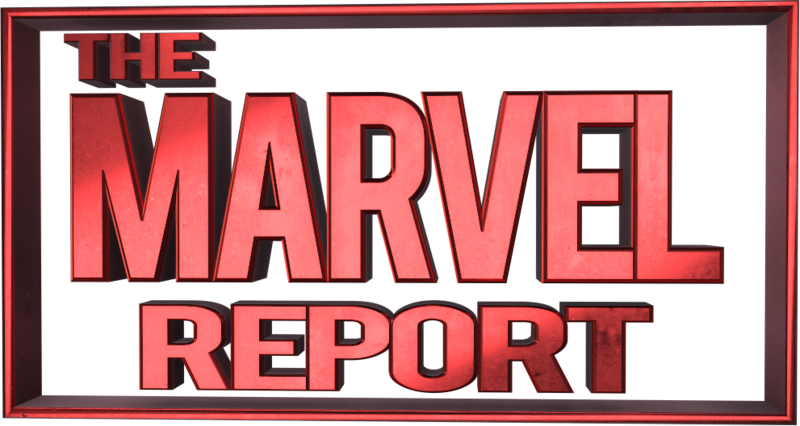 While that may be to the detriment of the overarching plot, it’s barely a blip when compared to the emotional upheaval that the protagonists undergo. Rogue especially has to be willing to take on not only a confusing array of memories and powers, some of which don’t belong to her, but also to accept all the dark and scary parts of her relationship that she hasn’t wanted to accept. Gambit, for all his jokes and flaws, is one step ahead of her when it comes to their romance; he plays the role of supportive and patient partner, which is for the best. The most interesting aspects of the story are the emotional ones, and Kelly Thompson delivers those in spades here. I will admit to being a little let down that the mystery wasn’t wrapped up by any stretch of the imagination, but at least it leaves the door open to revisit this villain in another book. 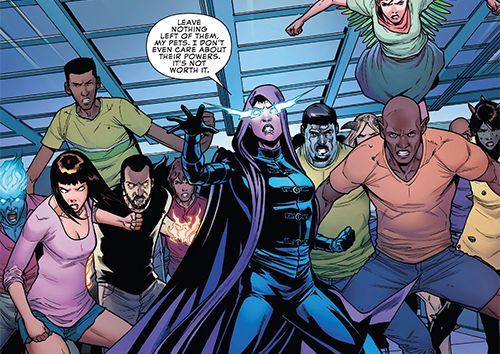 Even though readers will be left with many questions regarding who was behind the supposed therapeutic clinic and why Lavish chose it as her venue, the end of Rogue & Gambit #5 still feels like a victory. The mutants saved the day and their relationship in one fell swoop, and everyone involved learns how important it is to accept the bad with the good in order to become whole. Art: Pere Pérez and colorist Frank D’Armata make an excellent team as they see Rogue & Gambit‘s artwork through to the end. The line work is impeccable and the colors stand out whether it’s a big battle sequence, of which there are several, or a fragmented journey through the past, of which there are several more. Pérez and D’Armata play quite a bit with the metaphorical side of Lavish’s powers, finding interesting ways to incorporate the protagonists’ romantic past into the fights at hand without breaking the flow of the present narrative. 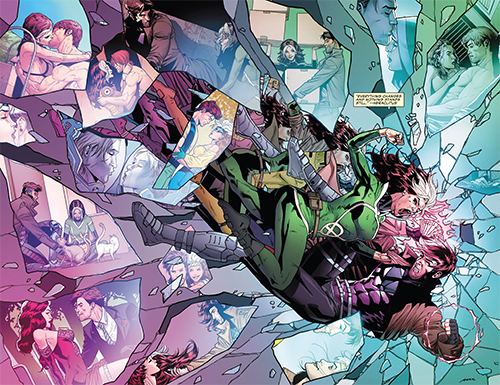 Pérez’s talents shines most in differentiating Rogue and Gambit from their alternate selves, especially when it comes to parading the various looks and outfits that they’ve worn over the years. Considering that they’re fighting doppelgangers which readers must be able to distinguish from their prime selves as well as experiencing memories from their past, it’s quite a feat that he pulls off splendidly with the help of D’Armata’s vibrant colors. It’s definitely a plus to have one artist throughout the miniseries’ run, and Rogue & Gambit #5 finished strong in terms of aesthetics. Verdict: Rogue & Gambit #5 is a fitting conclusion, or better yet beginning, to the next chapter of its title characters’ lives. Some may be disappointed by the resolution of the villain and the clinic, but the dynamic between the two X-Men should more than make up for it.